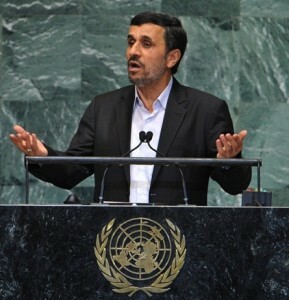 This past week, a number of world leaders spoke at the United Nations, including the President of Iran, Mahmoud Ahmadinejad. In reporting his speech, NPR cited parts of his speech, indicating that he was “speaking though a translator”. Actually, NPR was the one using and needing a translator. 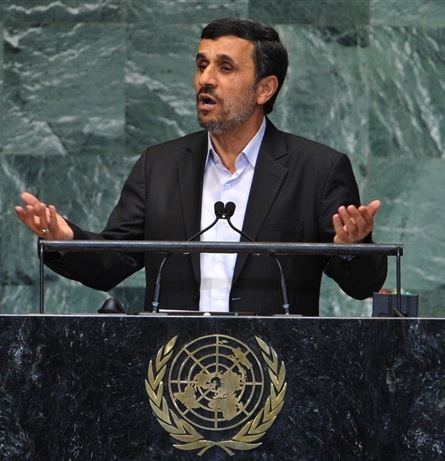 Ahmadinejad was perfectly okay with speaking Persian. Yet the reporting (not only at NPR) implied through the frequently used wording that his speech could only be understood as rendered “through a translator”. Is this a picky point that doesn’t actually matter? I don’t think so – it reinforces the unfortunate American sense that to be understood and taken seriously people need to be using English. Couldn’t we report Ahmadinejad’s hateful speech as “translated here from the original Persian” or something else along those lines. It would be great to show that it’s possible to use other languages to communicate. What? 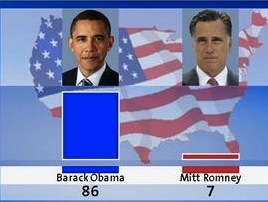 How does this poll have such a lopsided result when all others show the race to be neck and neck? The answer is that this was a poll in Germany. It indicates how vastly different the views of our president are in other countries. His popularity in Germany is common to many European countries. There are likely a number of reasons for this phenomenon. Policies viewed as “liberal” or even “socialist” in the US are mainstream in many other cultures. Universal health care, for example, is something that in many other countries is a given – a fundamental right the government should guarantee. It’s also the sense of dramatic change that the election of Obama represented, with a transition from the “don’t mess with Texas” perspective to a more internationally cooperative viewpoint. In fact, what’s important to Europeans and others outside the US is the American president’s foreign policy, usually a matter of little concern to American voters. For Europeans in that respect there was with Obama a welcome change form a president starting two wars to a Nobel Peace Prize laureate. Of course, Obama’s popularity in Europe is unlikely to bring him any votes in the United States. On the contrary it is likely to be seen as an indication of Obama’s left-leaning politics and kowtowing to foreigners. The French daily Le Monde’s endorsement of John Kerry in 2004 was seen by many Americans as one more reason not to vote for him. Even worse was the fact that Kerry was reported to speak French! Mitt Romney is reported to speak French as well – but you won’t hear him trumpeting that fact on the campaign trail. It’s a big plus for American politicians to be able to speak some Spanish – but other languages are suspect. Instead of celebrating the fact that knowledge of another language expands one’s horizons and provides unique insights into one’s own culture, Americans suspect second language speakers of mixed loyalty. In fact, many Americans would assert that they don’t want their leaders to have wider perspectives or open minds – if you have all the answers you don’t need alternative views. This is the same kind of mentality that sees the USA as the greatest country on earth without ever having seen any other country.